Singapore (Singapore) – November 23, 2018 (travelindex.com) – Travelindex has recently launched its restaurant guide, Top 25 Restaurants – the Mastercard Affluent Dining Guide in 5 key cities across Asia Pacific. Top 25 Restaurants is the World’s 1st Restaurant Guide based on AI through it’s unique “Restaurant Rating Index”. The ratings and ranking are based on patented, artificial intelligence and natural language processing technology, and, importantly, re-assessed by some of the world’s top culinary experts. Top25Restaurants.com is the world’s 1st restaurant guide based on AI. The culinary experts are passionate and knowledgeable about food and restaurants they assess the décor, ambience, service, quality of ingredients used and cooking techniques, the personality of the chef in the cuisine, value for money, and overall consistency. 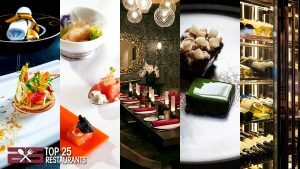 Top25Restaurants.com is celebrating fine dining in each city highlighting its the culinary dynamism, as well as new trends and chefs supporting local community products. Top 25 Restaurants contributes to the prestige of the local fine dining scene and, with the integration into the Travelindex global ecosystem, contributes to attract more visitors and tourists to the cities and countries.